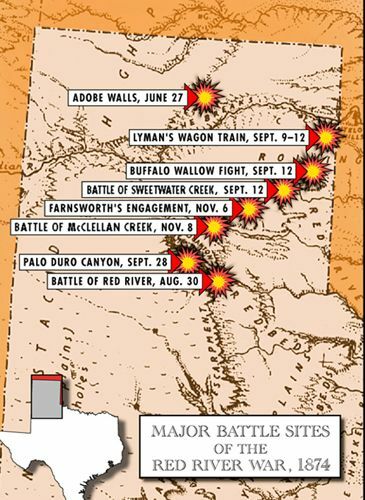 The Red River War was a military campaign launched by the U.S. Army in 1874, the objective was to remove the Comanche, Kiowa, Southern Cheyenne, and Arapaho Indian tribes from the Southern Plains and force their relocation to reservations in Indian Territory. 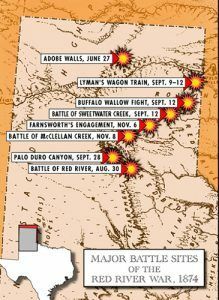 The campaign began in June 1874, after numerous attacks on settlers by the Southern Plains Indians. However, these attacks were spawned by the government’s default of its obligations under the 1867 Treaty of Medicine Lodge. The treaty called for two reservations to be set aside in Indian Territory — one for the Comanche and Kiowa and one for the Southern Cheyenne and Arapaho. It also provided for training, housing, food, and supplies, including guns and ammunition for hunting. In exchange, the Indians agreed to stop their attacks and raids upon white settlers. Though the reservations were established, the other provisions fell far short of what the tribes were told to expect. Food and supplies were consistently limited or failed entirely and commercial buffalo hunters ignored the terms of the treaty as they moved into the area promised to the Southern Plains Indians and began to slaughter the beasts by the thousands. Outlaws and profiteers, also trespassing on the land given over to the tribes, stole cattle from the Indians and trafficked in illegal guns and liquor. Though the Quaker Missionaries, who had been established as Federal Indian Agents, tried repeatedly to get the government to address these issues, they received no cooperation from the Office of Indian Affairs in Washington or from the military. As conditions continued to worsen many of the Indians on the reservations began to leave, joining up with renegade bands who had returned to the Texas plains. Without sufficient rations and their mainstay — the buffalo, being wiped out by hunters, the tribes were in a desperate situation. 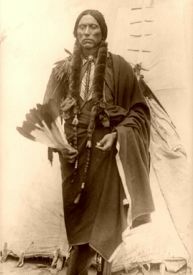 A Comanche medicine man named Isa-tai called for a Sun Dance in the spring of 1874, even though the ritual had never been part of the Comanche tradition. At the gathering, Isa-tai foretold a victory to the warriors who participated in a battle to rid the buffalo hunters. He and Comanche Chief Quanah Parker, then formed a plan to attack the buffalo hunters and after recruiting a number of warriors, they headed to the Texas Panhandle with a plan to destroy the settlement at Adobe Walls. Known as the Second Battle of Adobe Walls, a combined force of some 700 Comanche, Cheyenne, Kiowa, and Arapaho warriors, led by Chief Quanah Parker and Isa-tai, attacked the buffalo camp early in the morning of June 27, 1874. Though the post held only 28 men, including Old West characters, Bat Masterson and Billy Dixon, Isa-tai’s prophecy proved to be an illusion. Despite being dramatically outnumbered, the hunters’ superior weapons repelled the Indian assault. After four days of continuous battle, about 100 men arrived to reinforce the post and the Indians soon retreated. While estimates vary as to the losses, as many as 70 Indians were killed and many others, including Parker, were wounded. The result of Adobe Walls was not only a crushing spiritual defeat for the Indians, it also led to the Red River War of 1874-75 that would eventually end in the final relocation of the Southern Plains Indians to reservations. After the battle, the U.S. Army quickly made plans to subdue the Southern Plains tribes permanently. Within no time, thousands of troops were sent to the Texas Panhandle, encircling the region where the Indian bands were situated. The plan called for the troops to maintain a continuous offensive against the tribes, and as many as 20 engagements between the U.S. Army and the Southern Plains Indians took place over the next year in the Texas Panhandle region, Indian Territory, and southern Kansas. Wearing down the Indians, who were constantly on the run, the well-equipped Army cornered many of them in the Battle of Palo Duro Canyon on September 28, 1874. The remaining Indians still at large fought in numerous small skirmishes throughout the autumn and winter of 1874-75. However, the dedicated army was replenished with more soldiers from Fort Sill, Oklahoma and Forts Griffin and Richardson, Texas. 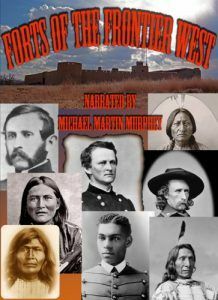 The Indians continued to surrender until the last holdouts, Quanah Parker and his warriors, surrendered to at Fort Sill, Indian Territory, on June 2, 1875. On that day, Colonel Ranald S. Mackenzie at the head of the Fourth U.S. Cavalry attacked and destroyed a large Indian encampment in Palo Duro Canyon. Mackenzie’s scouts followed the Indian trail to the edge of Palo Duro Canyon before the soldiers descended the steep slopes to the valley floor 700 feet below. Taken by surprise, the Indians abandoned their villages, allowing Mackenzie to capture more than 1,100 horses that were later slaughtered to prevent recapture. Although few Indians or soldiers were killed, the unrelenting pursuit of the troopers and the cold weather ultimately led to the end of the Indian resistance. The warriors, without horses and short of supplies, began drifting back to their reservations.